Egyptian women have been on the frontline of the revolution since the beginning: in Tahrir Square and beyond they have faced tear gas and bullets to defy both Mubarak and his generals in the struggle for bread, freedom and social justice. However, the role of women as workplace organisers and trade unionists has often been hidden from view. This briefing by MENA Solidarity Network to mark International Women’s Day 2012 is therefore about bringing the voices of the courageous women building independent unions in Egypt to a new audience. The stories told by the women here are only a small fraction of the hundreds of thousands of women workers who have been at the heart of the huge waves of strikes which have shaken Egypt since 2006, and which played a crucial role in the downfall of Mubarak. They are representatives of a new generation of activists in the workplaces and the streets who showed that ordinary people can still bring tyrants down. There are many questions which hang over the future of the revolution. Will these women find a way to translate the gains they’ve made in self-organisation in the workplaces into a stronger voice in the political arena? The contrast between the upsurge in women’s activism in the workplaces and the street and the small numbers of women elected to the post-revolutionary parliament is stark. And for the women activists who speak out in this briefing, the question of who the parliament represents is not just a question of gender. All the mainstream parties in Egypt are agreed that the workers’ strikes and protests must stop, and they have no alternative to continuing the neo-liberal policies which have forced millions deeper into poverty. This is why the ‘feminism’ of the old regime, represented by the dictator’s wife, Suzanne Mubarak, had nothing to offer Egyptian women workers. While she sat in air-conditioned conference halls discussing women’s rights, women like the activists here were fighting stop privatisation, cuts in welfare and education and for their right to organise and speak out at work. The stories told here are not just important to understanding the Egyptian revolution. They can be woven into our own battles. I spoke at meeting in Birmingham recently, and a colleague from UNISON got up and recounted how the uprising against Mubarak was on everyone’s lips as thousands of mainly women council workers discussed building for strike action against at savage council cuts at a mass meeting last March. 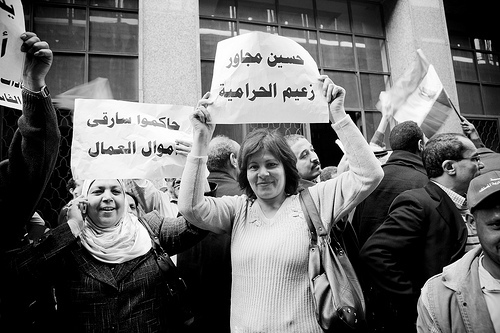 The most important message of the Egyptian revolution, is that for all us – women and men – real liberation comes from below. Get involved and active: find out more here.